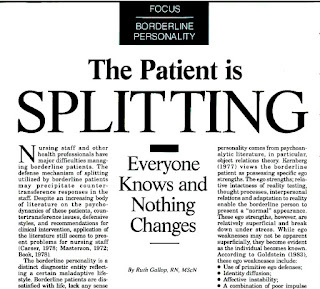 I have a paper out in Psychoanalytic Psychotherapy about mental health team splitting in relation to the diagnosis of borderline personality disorder. The paper is a critique of the way that clinicians have come to think and write about the idea of splitting. An individual is said to have split a treating team when their differential behavior toward different members precipitates polarized feelings and opinions about their care and concomitant professional discord. Such a split can manifest in a number of ways, but commonly a staff team becomes organized into two starkly opposed groups. Individuals in these camps may come to have strong positive or negative feelings toward the patient and hold opinions about them that are radically different from those of their colleagues. I remember when I first heard about splitting. In my first job in mental health I was asked for something by one of the residents. A colleague took me aside and said in hushed tones "she's splitting!" I had no idea what she was talking about. I have kept on hearing about splitting ever since, and it seems clear to me that, although there is often something important happening when the term is used, the way we think about it is hopelessly over-simplified. I have seen situations where the identification of splitting takes on the quality of an accusation, and seems to function to absolve staff of any responsibility they have for being kind or thoughtful. I have even seen instances of frank cruelty by staff that are later explained away as being produced by the patient through their splitting. It wasn't always like this. In early descriptions of team splits (Tom Main's "The Ailment" is often cited as the first appearance of the concept in the literature), you tend to see a complex description that takes into account the ways that we are all prone to intense emotions and the resulting interpersonal disputes. Main's essay describes a phenomenon that he observed in a hospital whereby the emotions of staff and patients interacted with one another in a complex way to produce splits. He invokes the emotions of staff, and explicitly says that splits are not caused by patients. Main's observations morphed as they were recounted by subsequent authors. The jargon heavy language of psychoanalysis increasingly entered the picture and splitting became understood as a distinctive set piece that could be seen as originating in the patient. The 1980s were a turning point. 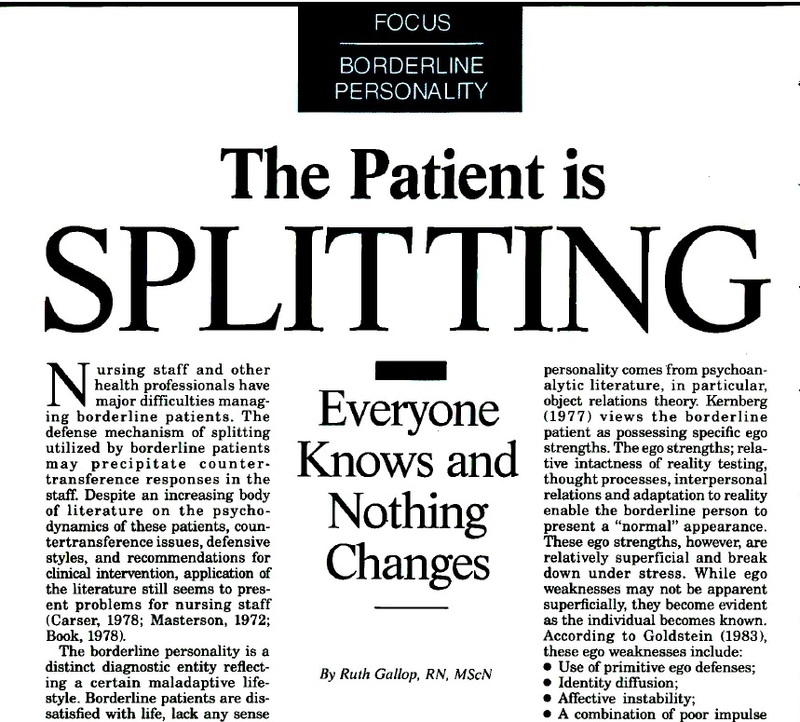 An article by Glen Gabbard from 1989 appears to have been particularly influential in cementing the view that splitting is driven principally by the use of projective identification by a patient and counter-transference responses in clinicians. Both of these are somewhat useful concepts, but they can end up putting a lot of responsibility on patients and absolving clinicians for their emotions and behaviors. Projective identification tends to be written and spoken about in magical ways (talk of people "putting feelings into" one another, which the psychoanalyst Morris Eagle once noted would be considered delusional in some contexts), and counter-transference has that useful "counter" prefix, which implies that the therapist's feelings really belong to the patient (they are just a "counter" to their "transference"). In fairness to Gabbard, he does try to emphasize the role of staff psychology but the language used seems to imply that splitting is centered, in an important way, on the activity of the patient. “these patients selectively divide or split the nurses into good or bad persons. The conflicts and splitting of the nursing staff can carry over to the treatment team, and polarization of staff can occur, particularly as transference and countertransference reactions evolve” (Bland & Rossen, 2005 p.510). Look at the way this is framed: "Conflict can arise as a consequence of consumer splitting" and "these patients selectively divide or split the nurses into good or bad persons." In this language we have inherited an idea that I call "the borderline as splitter." When a person is viewed this way, whatever caveats are added, they are easily viewed as doing something nefarious on purpose. A better model would be to consider how strong emotions impact groups of people. While clincians and theorists may sometimes pay lip service to the complexity and interpersonal quality of professional disagreement (but often don't), the temptation to blame it entirely on a patient's emotions is strong, especially when the alternative would entail acknowledging your own emotional responses and vulnerabilities . The "borderline as splitter" idea is plainly a fiction. Think about all the things that have to happen (or fail to happen) in order for a staff team to disagree about a person under their care and for this to escalate into an dysfunctional dispute. It is constitutive of a process like splitting that it involves more than one person. It takes two to tango, and it takes an entire team to split.